Little Witch Academia: This time around Little Witch Academia is properly featured on Animage, which means we did have access to the staff – and there’s good news to go along with it! We had a run of slightly subpar storyboards after Masayuki smashed it out of the park on episode 3, but things might get exciting once more. 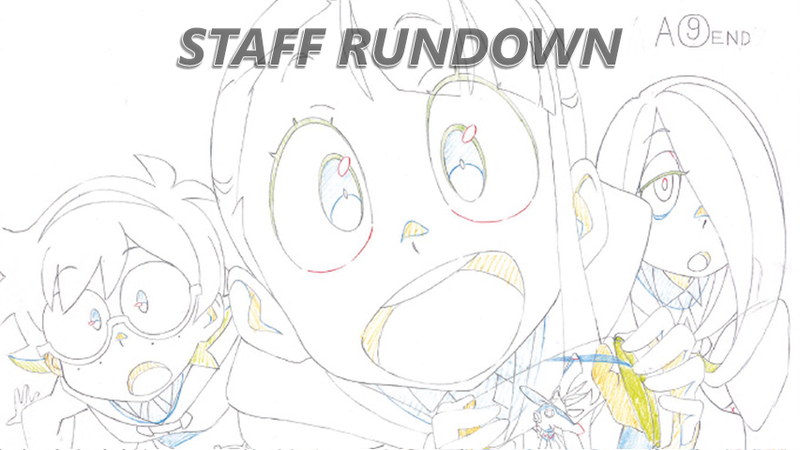 As we informed you last time, Imaishi finished an LWA storyboard before leaving to a still unannounced production. Not only that, his good pal and successor of sorts Akira Amemiya did as well. This means that for the next two weeks LWA might get wilder than we’ve ever seen before, perhaps closer to the style people associate with Trigger to begin with; for the good and the bad, the Kanada sensibilities and the ironic abuse of flat layouts and carton cut-outs. An exciting development for sure though, and one I’m quite hopeful about as well. Episode 9 also stands out, as it’s storyboarded by the comedy master Daichi Akitaro. His directional career on such light-hearted shows spans for decades at this point, and recent outings prove he hasn’t lost his touch. DJ Tonkatsu Agetarou made its core joke work for the entire series after all, and Nobunaga no Shinobi remains one of the most endearing short anime no one is watching. LWA seems like very fitting material for him to handle! Youjo Senki: As you may have noticed, this show appears to be suffering from scheduling problems. There could be many reasons for this dire situation, but the most likely one was mentioned in this recently published interview with some of the industry’s most experienced producers. A new studio was assigned a troublesome project and couldn’t handle it with the level of polish they aimed at, thus the production eventually fell behind too much to be sustainable. The step that follows already happened: the broadcast got delayed and they slotted a recap episode this week instead of episode 7, which was originally planned to air as listed in anime magazines; it’s lucky enough that the series had a free TV slot at the end so they might still be able to fit in the entire broadcast without arranging new airings, but it does strongly hint at the recap being unplanned and thus bad news. But back to the topic. Episode 8 actually does look promising! Hiroshi Kobayashi – storyboard artist and director par excellence mainly known for directing Kiznaiver – is handling the boards with Hunter x Hunter’s migmi in charge of directing. Ex-Gainax staffer Hiromi Taniguchi is scheduled as its sole animation director, but knowing the situation they’re now in, it’s a bit unlikely she’s actually handling the episode alone. Maidragon: KyoAni is hitting quite the impressive staff streak. Yoshiji Kigami’s episode 6 will be followed by Noriyuki Kitanohara, two veterans who might go all out with the animation whenever they please as if it was the most natural thing. And of course, Naoko Yamada will be directing and storyboarding after that as they introduce the last main character. She will even be assisted by Futoshi Nishiya as animation director, completing the Koe no Katachi team; they joked about how they hadn’t ever worked together like that after over a decade at the company, but they must have liked it a lot if they’re immediately repeating. It’s also worth pointing out that episode 9 will be Shinpei Sawa’s first storyboard for TV anime, the final step in his gradual promotion to episode director. He fared very well in his debut on the second episode, and having further control will give him more chances to insert the heavily kinetic and grand-scale scenes he personally enjoys. Expect some great work! 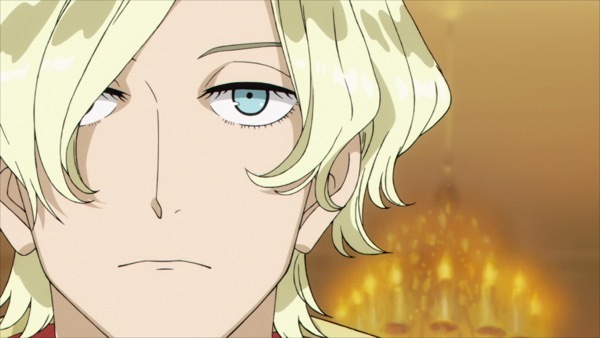 ACCA: This show was once again not featured in anime magazines, but there’s still the official website updating weekly with the lineup for the next episode. And this time around it may have the most interesting staff list yet! The same team that handled the great looking third episode is returning with a very interesting addition: costume designer and webgen superstar Shun Enokido as co-animation director. Enokido directed the outstanding animation showcase Flip Flappers episode 8 last season and I’m interested to see his more reserved character motion, which he’ll surely need for this show. Kira Kira Precure a la Mode: Precure remains in a solid spot this month, though the realities of long running productions are beginning to show. Nothing exemplifies that better than episode 4; directed by Yukio Kaizawa, its most brilliant series director and sadly obscure genius…and animated by Toei Philippines, who are always tasked with very rushed and low priority work. Kaizawa can carry it all through his storyboard prowess alone, but it’s a bit of a sad example of resource management. Episode 5 feels like a more thoroughly interesting opportunity, since the always solid Narumi Kuroda will return to storyboard for a franchise she’s done lots of good work for, and Ken Ueno will be there as animation director. This will be Ueno’s comeback to TV anime after doing an exceptional job on Mahoutsukai Precure‘s film, and the prospect of him handling Umakoshi-school designs is frankly exciting. Let’s not forget that he was the person trusted with Umakoshi’s own designs on Rie Matsumoto’s Heartcatch Precure movie, where he fared incredibly well. Ueno’s slowly but surely becoming one of Toei’s invaluable animation assets, so his episodes are well worth being excited for. Naruto Shippuuden: New Naruto side story equals new series director. This is how the things seem to be now, and the latest arc was assigned another particularly good one – Masahiko Murata. He storyboarded, directed, supervised the animation and solo key animated (!) episode 495 which featured striking drawings loose to a level the series had rarely before. But that’s not all…he’s doing the same for episode 496! Well, possibly not also animating the entire thing but who knows at this point! Pokemon Sun and Moon: Fans who have been following the franchise for a long time might not need this notice, but since Sun and Moon seems to have revitalized the TV series’ following overseas it feels appropriate to point it out: Masaaki Iwane will return on episode 15! He’ll be co-supervising the animation on an episode directed by the grizzled veteran Yuji Asada, possibly giving Iwane a chance to key animate the whole episode – something he does with terrifying regularity and spectacular results, for those unaware. Also very interesting is Isao Nanba’s animation direction debut on episode 16. He won’t be handling the entire episode by himself, but the rising digital animation star is definitely worth keeping an eye on. The series has been an excellent canvas for him to prove his worth, as seen on his very lively work on the first episode and striking stock footage with clear Shingo Fujii influences. Tiger Mask W: The series continues to be supported by a healthy mix of Toei veterans and the studio’s newer generations. The biggest surprise this time around in that sense is the return of Munehisa Sakai to direct episode 21; Sakai had spent his entire career at Toei where he directed outstanding family themed episodes and less fortunate full projects, then left and ended up with a big role on MAPPA’s Days, which reunited plenty of ex-Toei peeps. He won’t be storyboarding this episode, but his personality is strong enough to leak either way. Perhaps he’ll maintain a similar relationship with the company as Takashi Otsuka, another fantastic director who went freelance but still regularly work with Toei on franchises like One Piece and Precure. Anyway, good news for Tiger Mask! KonoSuba S2: This is a detail regarding an episode that aired this week already, but its implications might entail the future of the show as well so it feels worth mentioning. Yasuyuki Ebara will be staying as a regular episode director and chief animation director, since as it turns out he left Attack on Titan and has been replaced as one of its action animation directors for season 2. Ebara offers a very different style to the series than Koichi Kikuta, with less exuberant movement but more polish and expression achieved through very different means. And of course, a solid grasp of action as well, as you can guess from the title he wielded on other productions! Gundam: Iron-Blooded Orphans: This time I hope I’ll manage to recommend the right highlight episode, unlike last month! Things get trickier when dealing with a production that’s been going on for so long and isn’t on a healthy state to begin with. Episode 45 appears to have the pedigree of excellent action packed episode; action specialist Iwao Teraoka is handling the majority of the storyboard, supported by the show’s chief mecha animator Hiroshi Arisawa as mechanical animation director. Shinya Kusumegi, who’s in charge of mechanical animation direction on episode 44, is also scheduled to help out so chances are high we’ll get an episode full of mecha goodness.